Amed et Aziz ont trouvé leurs grands-parents dans les décombres de leur maison. Leur grand-mère avait le crâne défoncé par une poutre. Leur grand-père gisait dans son lit, déchiqueté par la bombe venue du versant de la montagne où le soleil, chaque soir, disparaissait. Amed and Aziz found their grandparents among the rubble of their home. Their grandmother’s skull had been crushed by a rafter. Their grandfather was lying in bed, torn to pieces by the bomb that had come from beyond the slope of the mountain, where the sun vanished every evening. The country appears to be in the midst of a war, civil or otherwise, and Soulayed, a visitor to their home, explains the nature of the conflict to the boys, warning them of the threat from beyond the mountains. 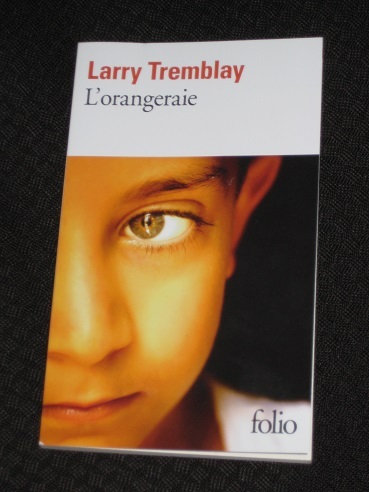 L’orangeraie is a short heart-rending tale, a confronting novel about the horrors of war. Tremblay examines how much can ever be justified, even in the fiercest of conflicts, with a particular focus on the role of children. Each step of the journey brings more horrors, and we see how innocence is lost when adults decide to drag children into their affairs, demanding more than any child could possibly be expected to offer. The fact that the boys in question here are identical twins is a further complication. The two have spent their lives together, so their impending separation seems all the crueller. But what can she do in a society where the man’s voice is what counts? Her plan is to make the most of a bad situation – but for that she’ll need her sons’ help. The novel is cleverly designed with a three-part structure. The first sets the scene, building the tension until the final decision is made, while the second shows the aftermath and the consequences of the family’s actions. The final part, set a decade later, then takes us to Quebec, where a university drama teacher is attempting to put on a play about the horrors of war. It’s here that we find a familiar face among the cast of students – a survivor, full of survivor’s guilt. 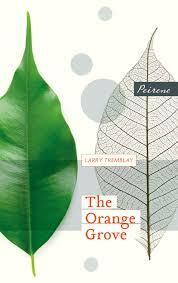 Tremblay’s novel is short and simple in many ways, and a quick and easy read. However, it’s also poignant and affecting, with the writer actually concealing far more than we realise. As the story progresses, it twists slightly, with several surprises, and it’s often a good idea to go back and reconsider earlier events in the light of new facts. The last section is also impressive. Just when you think the story couldn’t get any sadder, the final version of events contains one more savage blow. I’m not sure that The Orange Grove got a whole lot of coverage when it appeared in English, and that’s a shame because this is a wonderful little book. It’s the sort of novel that could easily have been longlisted for the Man Booker International Prize (I can definitely think of a couple of books I’d happily have tossed aside in favour of this one…), and yet another wonderful choice by Peirene Press. While short, it’s never less than compelling, and it’s certainly a story that lingers in the memory. Hopefully, a few more readers will give it a try, and if they do, perhaps we might get more of Tremblay’s work in English in the not-too-distant future. I read this in the English version and thought it was marvellous. Powerful and clever and sad and timely. I think the Peirene version got a fair amount of attention and it certainly deserved it.